Introduction to Computational Economics Using Fortran is the essential guide to conducting economic research on a computer. Aimed at students of all levels of education as well as advanced economic researchers, it facilitates the first steps into writing programs using Fortran. 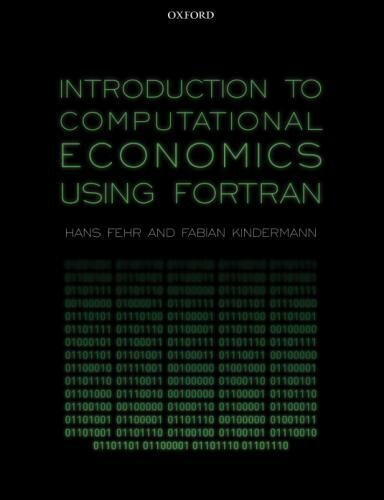 Introduction to Computational Economics Using Fortran assumes no prior experience as it introduces the reader to this programming language. It shows the reader how to apply the most important numerical methods conducted by computational economists using the toolbox that accompanies this text. It offers various examples from economics and finance organized in self-contained chapters that speak to a diverse range of levels and academic backgrounds. Each topic is supported by an explanation of the theoretical background, a demonstration of how to implement the problem on the computer, and a discussion of simulation results. Readers can work through various exercises that promote practical experience and deepen their economic and technical insights. This textbook is accompanied by a website from which readers can download all program codes as well as a numerical toolbox, and receive technical information on how to install Fortran on their computer.